Gangster movies used to be the golden formula for success in the local film industry. This year, however, they�ve been replaced by a string of local films that give center stage to the traditional good guys _ detectives and police officers. 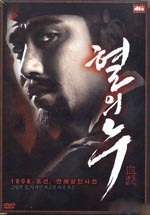 "Blood Rain" is a period piece, which takes place in the Choson period (1392-1910). The thriller film tells of a detective who investigates a serial murder case on a deserted island. Cha Seung-won, popular for comic roles in such movies as "Kick the Moon," "Jail Breaker" and "Teacher, Mr. Kim," will attempt his first dramatic role, playing a police officer. Blood Rain, set in 1808, takes place on a small island with a technologically advanced (for its time) paper mill. The presence of the mill has spawned a bustling village, and given its townspeople a certain degree of wealth. With weather and trees perfectly suited for papermaking -- and a location remote enough to ensure both privacy and secrecy -- the island has established a profitable business in high quality paper, with trade routes stretching as far away as China. It is on this isolated and largely self-autonomous island that a string of gruesome murders start to take place. It's not just the growing number of dead bodies, but the sickly innovative cruelty of the killing that breeds apprehension in Won-gyu (Cha Seung-won), a government investigator sent from the mainland to solve the case. Soon he discovers that the murders are linked to an incident seven years in the past, in which the former owner of the mill was executed for practicing Catholicism. The townspeople, for their part, are convinced that the dead man's ghost has come back for revenge. Blood Rain (no relation to the famous Korean novel of the same title) is the odd fusion of a labyrinthine, complex narrative that calls for one's deepest concentration, and heaps of medieval, gory violence to sicken one's stomach. Straight-on shots of skulls being crushed and men being torn limb from limb are interspersed with ruminations on class relations in Confucian society, and applications of Western and Eastern science as a means of solving the film's central mystery. The end result is certainly unique and memorable, but sadly its central concept seems to work much better as ideas in a screenplay, than as images on celluloid.